This adding machine calculator is useful for keeping a running total or "paper tape" when adding or subtracting money as in balancing your checkbook, doing your taxes, or any other calculation where you need to double check your entries. Input values and operators in the calculator, and review your math above. 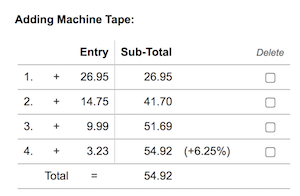 Print the adding machine "tape" to save a record of your calculations. There is a memory limit of 100 entries but you can click the "Reset" button to clear all entries and start fresh. auto mode allows you to use this adding machine with only your keypad, using numbers, decimals, operators, and the Enter key. auto decimal mode is the same as auto mode but assumes your entry has 2 decimal places. For example, if you enter 5236 in auto decimal mode and hit the Enter key, the calculator will insert a decimal point before the last two digits so your entry becomes 52.36. If you want to enter exactly 52 in auto decimal mode you must enter 5200. For both auto and auto decimal modes, the default function is addition (+). If you input only numbers and hit enter, the calculator will add the numbers. You can use your keypad to insert any operator before your number entry. Use + - * and / keys for addition, subtraction, multiplication and division respectively. You can also input numbers with a trailing % sign to make the operand a percentage of the current total. For example, if the current total is 300 and you enter +20%, the calculator will find 20% of 300 (which is 60) and will add that number to the total. The new total is 360. Calculate a 6.25% tax on your total by entering +6.25% last. This example calculation with the online adding machine calculator will calculate the sales tax for an itemized purchase. Suppose you sold three items priced at 26.95, 14.75 and 9.99 and you must collect a sales tax of 6.25% along with the total purchase. Enter the following (+26.95 <enter> +14.75 <enter> +9.99 <enter> 6.25% <enter>). Your calculator tape will show the subtotal of 51.69, a 6.25% tax of 3.23 and a total of 54.92 as in the image below. For additional help balancing your checkbook, see our Checkbook Balance Calculator. Furey, Edward "Adding Machine Calculator"; from https://www.calculatorsoup.com - Online Calculator Resource.